Our Model TL conveyors are rugged and heavy duty, their construction makes them ideal for long assembly line operations, inspection stations, testing, sorting, and packing. Model TL belt conveyors can be floor or ceiling mounted. 6-5/8″ deep x 12 ga. formed steel slider bed, powder coated. Reinforced with 3/4″ pipe which forms sockets for guard rails. 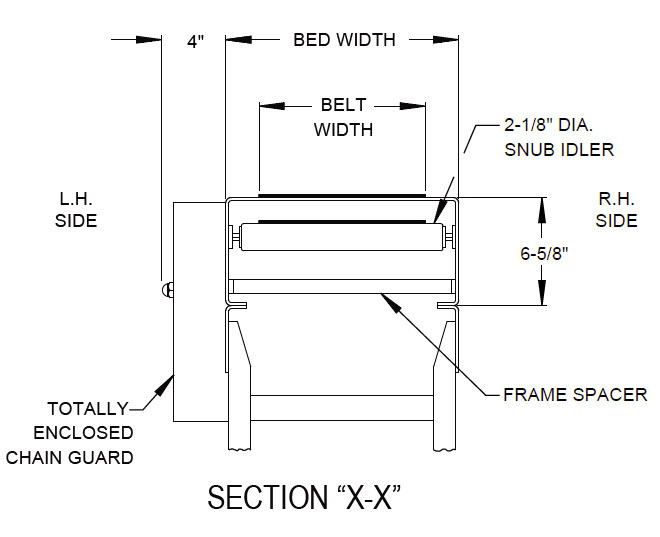 Bed sections are standard in 5′ and 10′ length and bolt together with splice plates. 48″ and 51″ bed widths are only available in 5′ lengths.